"Conversation Pieces" is a book about small things. The kind of treasures that are accumulated over a lifetime of traveling the world. Each short chapter chronicles themes related to these particular items. Each of these items are the kind of things one buys as a travel souvenir, receives as a gift of kindness, or simply finds laying around somewhere. None are particularly expensive, yet some are priceless prizes. 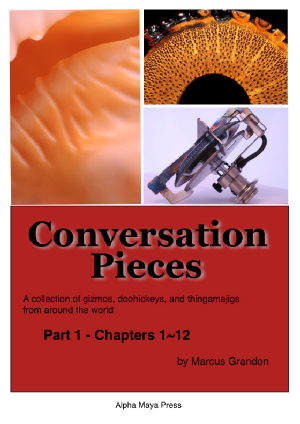 ***Click on book cover to open the e-book "Conversation Pieces"